Harry Potter fans will be excited to know that Universal Orlando has unveiled details of Diagon Alley in the Wizarding World of Harry Potter. Set to open this summer, a new ride – ‘Harry Potter and the Escape from Gringotts’ promises to be a “multidimensional, multisensory” experience in which visitors will ride through Gringotts bank vaults in vehicles that drop, spin and turn. The ride will also be more suitable for younger riders than the current award-winning Forbidden Journey. Diagon Alley will also have lots of new shops, including Weasleys’ Wizard Wheezes, selling novelty items and magical jokes, Ollivander’s wand shop, and visitors can dress up for Hogwarts school at Madam Malkin’s Robes for All Occasions. 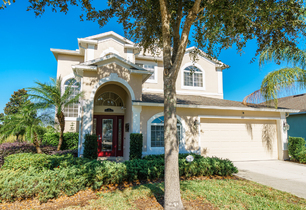 Just 15 minutes from Disney World, enjoy the 5 star treatment at this stunning 4 bed, 4 bath luxury home in the popular gated community of The Shire at West Haven. 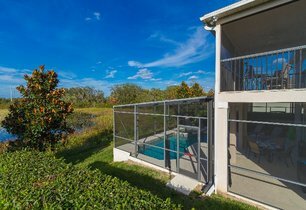 St. Andrews is situated on a very private plot in this prestigious area, overlooking a natural lake with an abundance of wildlife to watch from the great views from the pool and upstairs balcony. Fully air-conditioned, the house briefly comprises of spacious living room, family room, formal dining area, fitted kitchen and breakfast nook, 4 bedrooms, 4 bathrooms, games room, pool deck and balcony. There is wireless broadband internet and all bedrooms have ceiling fans, flat screen TVs and radio units with iPod docking stations. The pool deck has a heatable swimming pool with raised spa area, sun loungers and table and chairs for some outside relaxation. Guests also have access to the main clubhouse, which offers a large swimming pool, two tennis courts, beach volleyball and a small gym. It’s perfectly placed for visiting the popular Orlando family attractions such as Disney World, Universal Studios and SeaWorld. It’s also brilliant for keen golfers with a number of championship courses nearby, including two at the Greg Norman-designed Champions Gate (home to David Leadbetter’s academy), the renowned course at Reunion and Highlands Reserve.